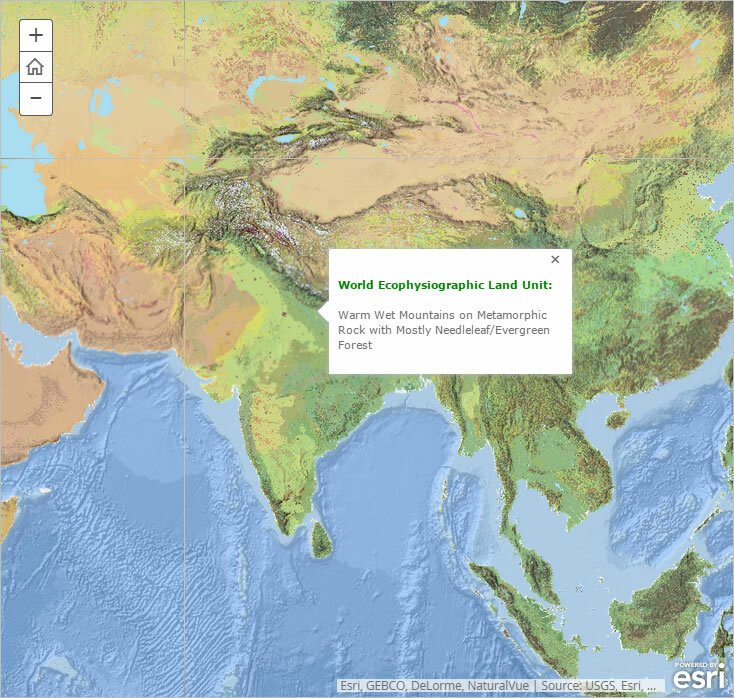 The US Geological Survey (USGS), with help from Esri, has created a global map of ecological land units (ELUs) to identify nearly 4,000 ecological areas that are unique combinations of four factors: bioclimate, landforms, rock type, and land cover. 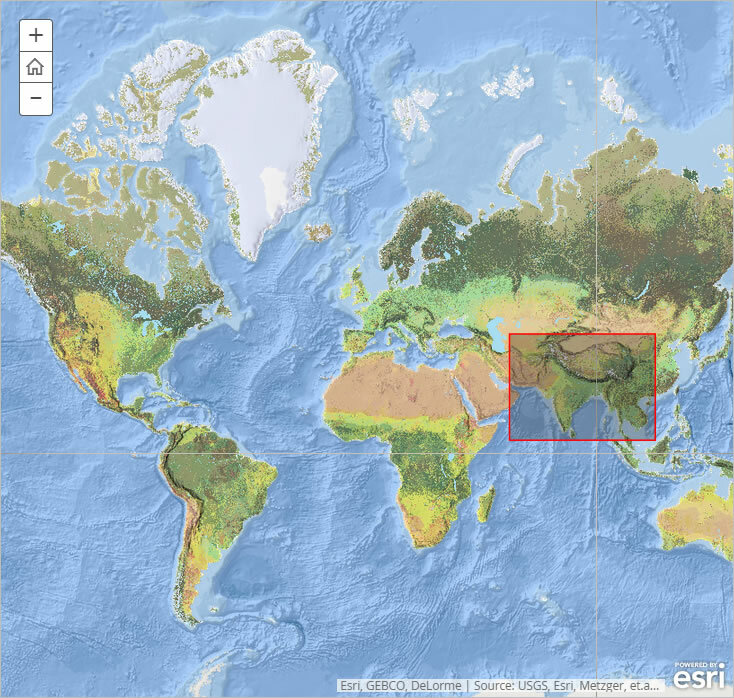 The World Ecological Land Units Map and its data are important for understanding and managing our world’s ecological resources. In the hands of scientists; resource managers; and, ultimately, policy makers, the map and data can be referenced to ensure that ecologically diverse areas are protected from neglect, development, and overuse. Here’s how to get the most out of the app. 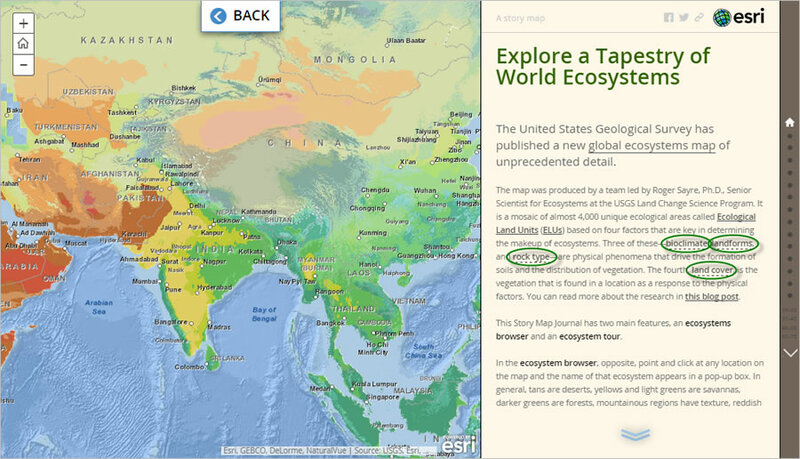 After you familiarize yourself with the map, you can start to explore some of the world’s most ecologically diverse locations in more detail. The page for any tour spot includes links that change the map so you can see each of the four factors that contribute to the location’s ecology. 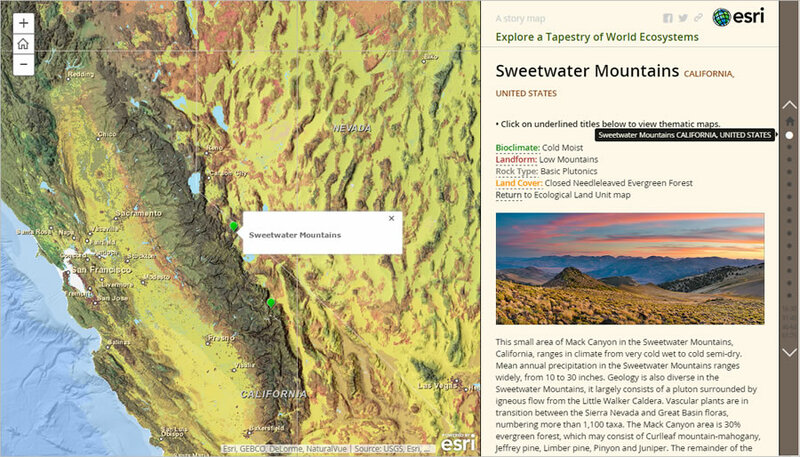 Click a link to see what the bioclimate, landforms, rock type, or land cover are in that area. A new map will appear that shows the factor you are interested in for the tour location you selected. 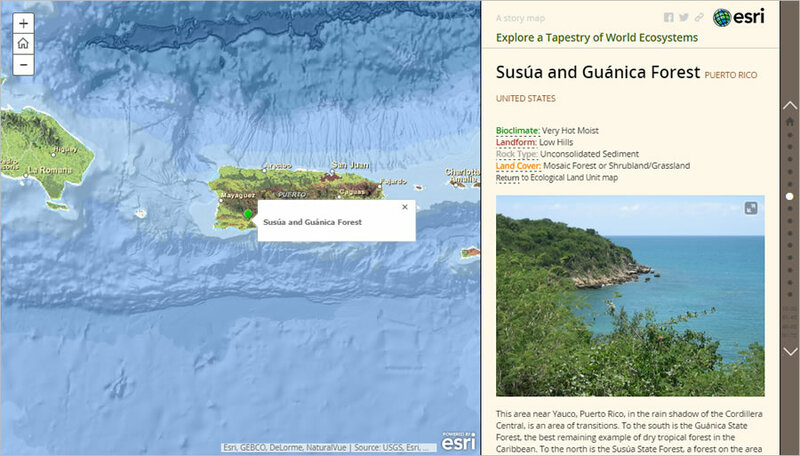 Here are some particularly interesting places: Susúa and Guánica Forest, Puerto Rico This subtropical forest in southwest Puerto Rico only gets about 30 inches of rain per year, unlike the El Yunque rain forest on the north side of the island which gets more than 200 inches of rain annually. The 1,000-acre park, maintained by Puerto Rico’s Department of Natural Resources, is home to many species—many of which are endangered. Susúa and Guánica Forest is considered the best example of a dry rain forest in the Caribbean. It was designated a forest reserve in 1919 and, in recognition of the efforts to conserve natural processes and resources in the forest, it was designated a United Nations international biosphere reserve in 1981. 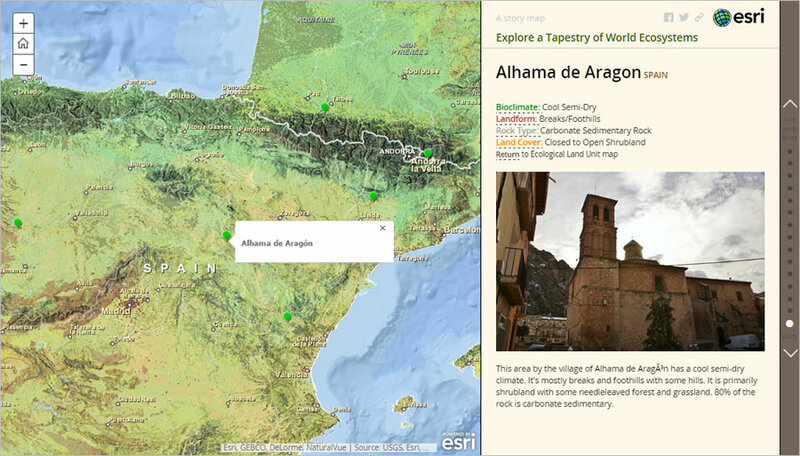 Alhama de Aragón, Spain The name of this town is derived from the Arabic word al-hammam, meaning “the baths.” Alhama’s hot springs are the source of one of the primary industries in the area—spa hotels. The carbonate sedimentary rock here is formed by a process of rapid precipitation of calcium carbonate, often at the mouth of a hot spring. The cool, semidry climate in this hilly region makes it ideal for growing fruit including grapes for wine. There are many fruit farms and vineyards in the area. The Komati River in the Drakensberg, South Africa Winding rivers, including the Komati, flow through the low-lying area at the base of the Drakensberg portion of the Great Escarpment. The open herbaceous vegetation is bushveld and highveld grassland. This is an important ecological region because it’s one of the last remaining strongholds of several grassland species. This once-expansive region has been disrupted by water transfer projects and drastically reduced in size due to agricultural fragmentation. Consequently, some of the species in the remaining highveld are now threatened with extinction. 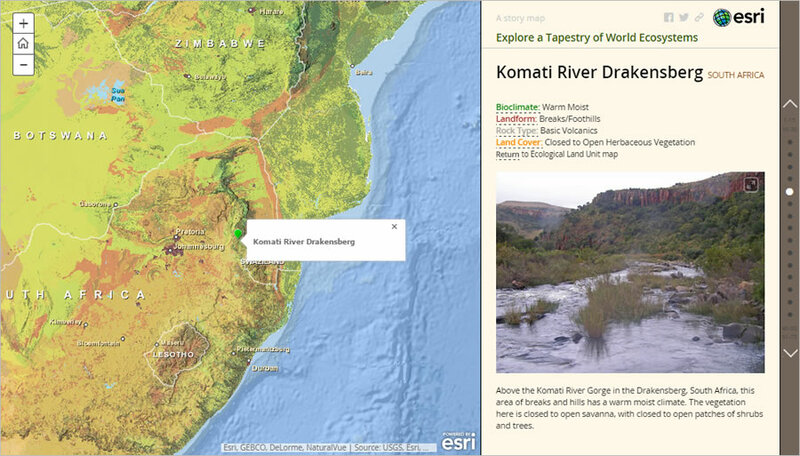 The Komati River Gorge is an ecological stronghold for some of the world’s most threatened grassland species. 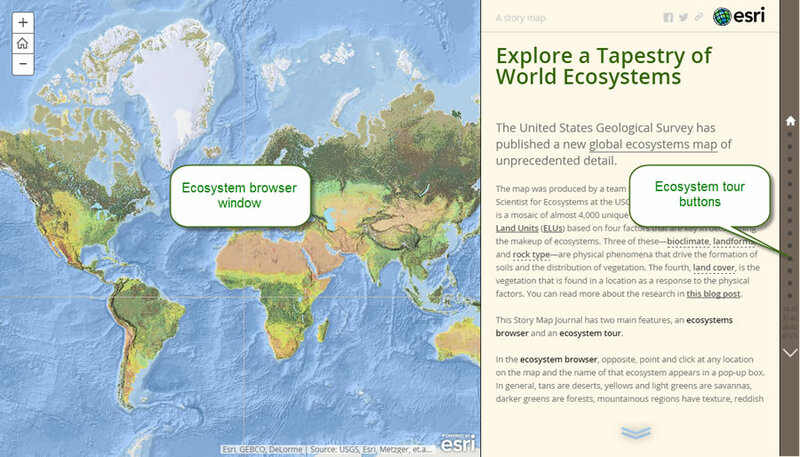 Once you’ve explored some of the amazing diversity of our planet through this map, you’ll want to share it with others. You can also use the share button to copy a hyperlink to the map. 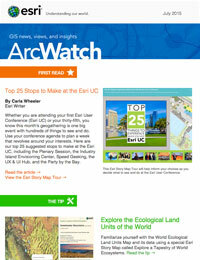 Paste the hyperlink in an e-mail or text message to share the map with your friends and colleagues. 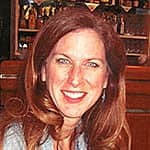 Or copy the HTML code if you want to embed the story map in a web page. Options to share the map include providing a hyperlink and HTML code.